March was a dry month on this blog. Sorry, loyal readers, for not entertaining you better. These two posts are the best of March. Click an image or link below to go to the post. Learn what you can and cannot do while on the subways of Seoul. These advertising campaigns approach subway etiquette with funny cartoons. 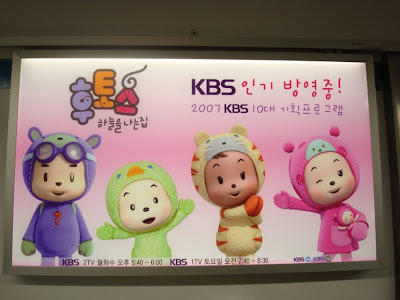 Korean Teletubbies? Hutos: The Flying House is a new show for preschoolers that shares a lot in common with the Teletubbies. But does it share too much? And is that a bad thing? Check it out and then weigh in your opinion. Goal for April: complete 15 posts. Thanks to all you readers and an extra thanks to those of you who leave comments and email interesting questions. More will come soon!